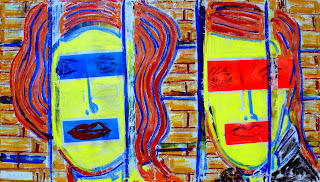 - ARTBAIAO -: Visiting the POP ART: wich of us is stuck? Visiting the POP ART: wich of us is stuck? de suas experiências. Sonhos sonhados com tinta, universos paralelo com leis próprias. Sua obra me provocou e sugeriu o texto. I observe that nowadays, your work often contains poeple that cannot talk, or are not free to talk.